We’ve been flailing around with our itinerary lately, making changes every day because of whims or weather. I suppose that’s how it should be, so we can explore what interests us, but the time came to get serious about our plans for the next few weeks. So this morning we pulled out the maps, the weather reports, and our lists of obligations, and put together a plan. The first decision was to move on rather than exploring Las Cruces. As a place to live it was never high on our list, and from my online searches there didn’t seem to be a lot to keep us here recreationally, either. Las Cruces is one of those places that is near a lot of stuff. The second decision was to skip Silver City. This was a tough call, since I like that town and there are fun things to do in the area. But the weather has not been cooperative lately, and Silver City is up around 6,000 feet. We may return later. The third decision was to attend the Tucson Gem Show. We were in Tucson for it last year and liked dropping in on all the various venues. This meant booking a moderately expensive stay at Beaudry’s RV Resort, because most places in town are full, but the location is very convenient. We’ll do a few days there for the show and then relocate a bit further out of town. And the fourth decision was to face reality: we have a lot of on our personal and work schedules in February, and the only way we’re going to accomplish it all is to park ourselves for a solid month. So we’ll stay in Tucson through the first week of March. But we won’t be sitting still. We have plans to explore two national parks, make an overnight trip up to Phoenix, visit Bisbee, fly to the Florida State Rally, check out local real estate, and make our plans to go to Mexico in March. Somehow all that will get done while I work on the Summer issue of the magazine. We can’t get into Tucson until Feb 3, so we’ve got a few days to kill. 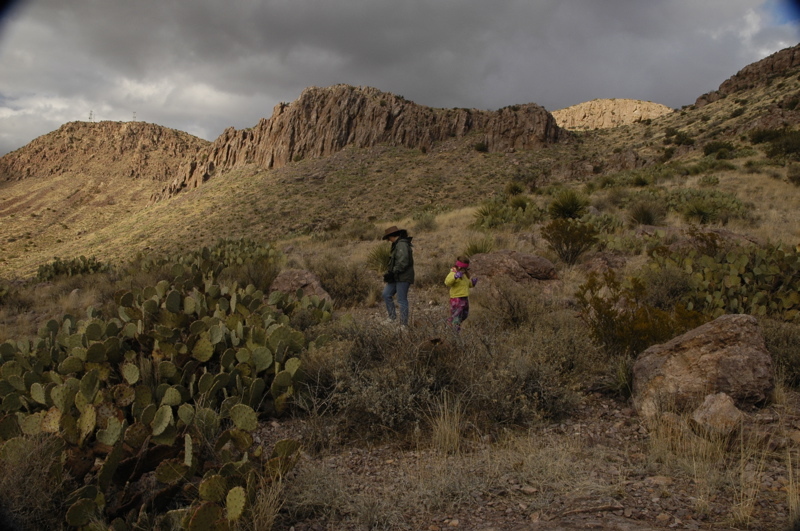 With the weather cold, we decided to head to Rockhound State Park, in Deming NM. Our Google Earth location. This park is at 4500 ft elevation but that’s about as low as we can get in this part of New Mexico. There is snow just a couple thousand feet above us, but here it is at least above freezing, and there’s frequent sunshine. Rockhound State Park was Emma’s choice. 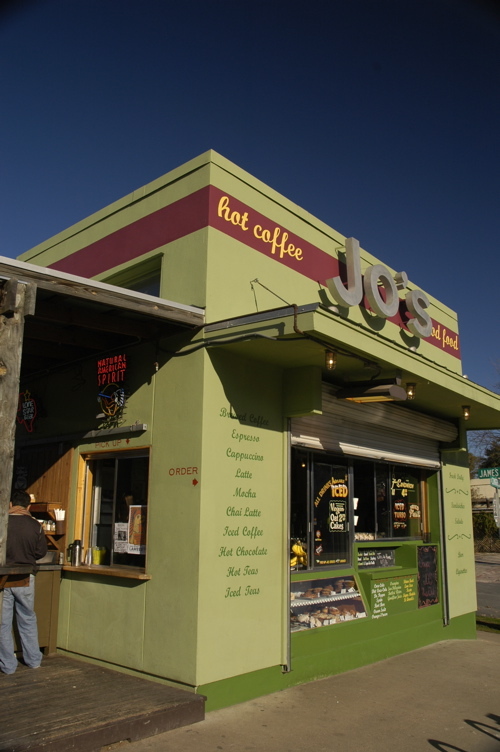 You can collect jasper, agate, opal, and quite a few other types of gemstones here. A short steep hike from the campground rewards you with beautiful views in all directions, and heaps of stone to pick through — no rock tools necessary! We found a lot of jasper, plus some other pretty stones we haven’t yet identified. The rangers in the Visitor Center will probably help us with some, and we may call on our friend Mike Bertch, who is waiting for us in Tucson, to identify the rest. While we were up hiking around, I also found a cactus with my knee, which required me to gently roll up my pantleg (in 40 degrees and a cold wind) and carefully pluck about thirty tiny spines out. Below a gray sky we bid adieu to the RV park, checked the post office one last time for any late packages, and towed the Airstream seven miles from our base elevation of 3,600 feet to the entrance to Carlsbad Caverns National Park at 4,400 feet. The Visitor Center and cave were virtually abandoned, which is not surprising considering the abysmal weather. All the winter tourists seem to be fleeing for warmer spots, which strikes me as an excellent plan except that there aren’t any warm spots outside of southern Florida and Mexico. We had no trouble parking all 50 feet of Airstream & truck in the lot. The cave was so deserted that we walked for over 30 minutes before encountering another person. We hiked down the Natural Entrance, which is about a mile and 850 feet of descent. This hike is strenuously cautioned by the park service. “Evalute your physical condition before attempting this walk!” “Weak knees are common!” Huh. It’s a walk downhill on a paved trail with handrails. Last time Eleanor did it seven months pregnant. Our National Parks pass got us in for free. Except now it’s the “America the Beautiful National Parks and Federal Recreation Lands Pass,” and now it costs $80 instead of $50. They’ve dropped the $15 eagle hologram, too. This new pass basically covers every Federal site that charges admission (but it doesn’t cover camping fees or added-value tours). We got this latest pass in Vicksburg when our National Parks pass expired, and using it today saved us $18, so we’ve got a few parks to go before it pays off. The cave is supposed to be a constant 56 degrees, but in winter the cold air above settles into the cave and causes a constant breeze at certain points on the Natural Entrance hike. Since today the temperature at the entrance was 29 degrees (with fog), we had a chilly hike in. Carlsbad is a park from the old school, so it features things you won’t see in other parks from a more enlightened era. For example, at Kartchner Caverns State Park in Arizona, they are so concerned with protecting the natural condition of the cave that visitors are sprayed with a fine mist to remove dust, and walked through several air-tight doors to control humidity. At Carlsbad, they have a restaurant in the cave. The restaurant was built in 1928, and not surprisingly the bathrooms directly adjacent arrived shortly after. There’s also a mailbox, so you can post a letter from below the Earth’s surface. In fact, you can do quite a bit of shopping underground if you care to. After an hour of hiking we stopped in for a snack and asked Emma if she wanted to see more cave, or ride the elevator up and out. “More cave!” So we hiked the entire Big Room tour too, for a total of about 2.5 miles. Considering that it was a totally dismal day, hiking underground beat the other options available. I had hoped for clearing by the time we emerged, but at 1 pm it was still very cold and cloudy, and we high-tailed it for the south. Along the route (Rt 62/180 to be specific) you have to climb up to 5,695 feet in the Guadalupe Mountains. Up there it was dense fog, temperatures in the upper 20’s and windy. I had to drive carefully, constantly on the lookout for ice on the road, until we descended back down before 5,000 feet. We are covering a lot of miles in order to have time to explore some things in New Mexico and Arizona before we have to fly out. So we have stopped for the night in Las Cruces, boondocking in the retail center while we consider our options. We may stay here a few days (in which case we’ll get a campground) or move on, depending on how things look. Three faithful blog readers have emailed me to say I talk too much about food. (You know who you are.) So today I’ll talk about water for moment. Specifically, how to deal with drinking water while we are in Mexico in March. The big advice you get from people about traveling in Mexico is “don’t drink the water!” Montezuma’s Revenge, a.ka. “traveler’s diarrhea” is the big fear. In most cases, it comes from drinking local water that has normal bacteria that our delicate US-based systems aren’t accustomed to. It can also result from critters in the water (worms, parasites). So the first line of defense for an RV traveler is to make sure the water in your fresh water tank is safe, for showering, brushing teeth, etc. We’ve got a couple of methods to assure the water in our tank is safe. We can fill it with known good water (bulk bottled water sold in grocery stores), or we can pre-filter it with a charcoal filter to remove excess organic materials and then chlorinate the water each time we fill the tank. Chlorination is pretty simple: you just add a measured amount of bleach to the water, and let it sit a prescribed time before using it. We’ll use a second charcoal filter at the kitchen sink to help remove some of the bleach taste (which is already built into our Moen faucet) and also let the water sit before bottling it for the refrigerator. Another good tip I got for masking the bleach taste is to add Kool-Aid, iced tea mix, Gatorade powder, or lemon/lime flavorings to the water. But most likely we’ll just use the tank water for showering and stick to bottled water for brushing teeth, cooking, and drinking. Beyond that, we’ll follow the advice I got from my friendly Airstream M.D. : be careful about eating local fare or questionable grocery items, peel all fruit and avoid ice or open drinks. If we were going to stay for a long time and eat out a lot, we might consider Hepatitis A vaccination as well, but that seems to be overkill for a one or two week visit where we’ll mostly be eating our own food. Today’s outing was to Living Desert State Park, up in Carlsbad. 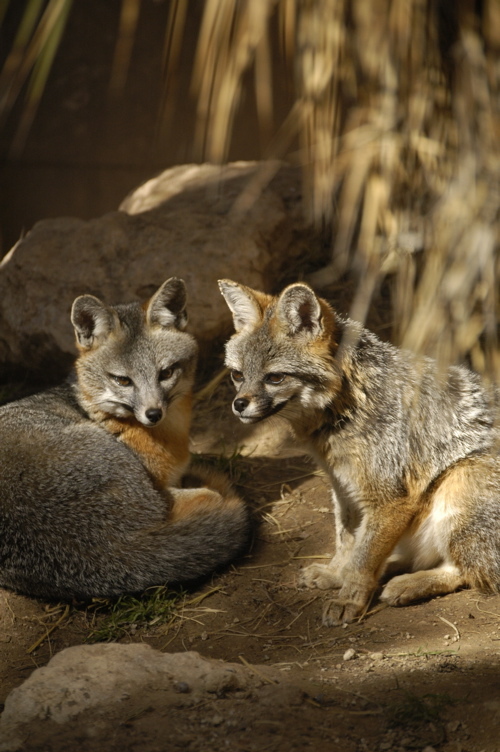 It’s really more of a zoological park, featuring landscapes, animals and birds native to New Mexico. It’s a nice spot on a sunny day, since the bulk of the exhibits are outdoors. For $5 (kids under 7 free), it’s a cheap half-day out, and very educational. As with any zoo, a long lens is essential to getting good animal photos. We would have gone to the caves, but weather suggested otherwise. It was a sunny and dry day today, perfect for walking around the park, whereas tomorrow we’ve got a chance of rain — or even snow. I doubt that will really happen, but in any case tomorrow seems the right day to explore the caverns. Then, we’ll head southwest. Seeing the Google Earth image of our campsite last night started me thinking. It’s amazing how we can go somewhere but not really know much about what’s around us, until we start asking questions and poking around. In this case, I had realized we were in an oil field when I spotted a derrick by the road, but had no idea how many oil wells were surrounding us. This morning I decided to make some mental notes as we drove through west Texas along I-20, and then Rt 285 north from Ft Stockton to New Mexico. Tallying up the things I saw as we drove turned a “boring” drive into a really fascinating one. Everything was worth noticing: oil wells, small gray deer among the cedars, ranch gates made of stone, sagebrush, mesas and buttes. The things we saw today tell me that we have crossed the line from low elevation and arid climate to a much drier high desert climate. At first, I-10 cuts through rolling hills, revealing cliffs of yellow limestone and millions of years of geologic history in sedimentary layers. Then around Ft Stockton, the ground becomes flatter and the plants gradually become more and more scattered. 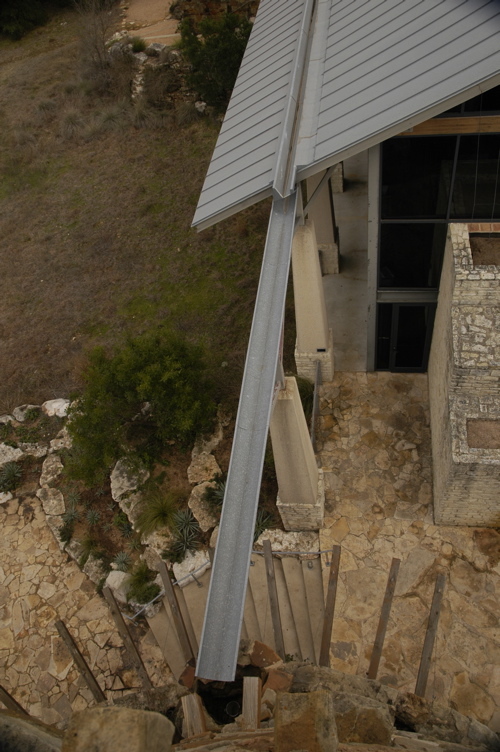 The cedars that help define the hill country are almost gone. The temperature drops more rapidly in the desert air at sunset (it was 37 when we arrived and has since dropped into the 20s) and even Emma’s hair is telling me that humidity is much less than it was a couple of days ago in Austin. We decided to skip Marfa and head north to Carlsbad Caverns. Emma’s still nonchalant about the caves, but Eleanor and I want to see them again. The last time Emma was here, she was still in the womb, and Eleanor was carefully walking down the cave’s natural entrance, eight months pregnant. We’ve parked at the only place in Whites City, at the entrance to Carlsbad Caverns National Park. Whites City is basically a tiny intersection at 3600 feet elevation, bearing the usual tourist stuff (restaurant, gift shops, motel, post office, etc). It’s a cousin of many such places around the country: Wall Drug in South Dakota, “The Thing” in Arizona, “South of The Border” in South Carolina, etc. Whites City is not nearly as interesting as those larger brethren, but definitely cut from the same cloth. It was once much more of a tourist trap than it is today. Along the highway leading here, you can still see the remains of dozens of black-and-red billboards advertising the place in its heydey. The few readable signs are a tip-off to how long ago that was. My favorite said, “WHITES CITY. KODAK FILM — FLASHBULBS”. When was the last time you bought a flashbulb? Best Western has taken over the former Whites City motel, but it still features a low-budget RV park out back, of the type you see all over the west: a dusty (or muddy) dirt parking lot, decaying facilities, questionable electric, wide open spaces and a view of the highway. Full hookups, $20. Many other western parks are cheaper, running as low as $10 but there’s no competition in Whites City, so they can charge more. There are about six or seven rigs here in the lot. It’s far from a luxury resort, so they must all be cheapskates like us, or unwilling to make the 20 mile commute down from Carlsbad. The first hint of the park’s status is the broken gate with a fragment of splintered wood sticking out. A sign warns that trailers must swing WIDE to avoid hitting the gate. They’re not kidding. It took us two tries to make it through without a long scratch on the streetside of the trailer. At our site, the first electric outlet we tried was mis-wired (reversed ground and neutral according to our tester), there were no caps to the sewer outlets, and the grill is completely rusted and burned out in the bottom, rendering it unusable. A heap of old Whites City billboards are piled just beyond our site in the cactus. Deep muddy ruts at the edge of the campground give testimony to a mighty battle that recently occurred with a large RV that was apparently trying to turn around and got stuck. The entire place has an air of benign neglect. But we don’t care. It’s just a place to park for the night, and as long as the water is potable and the sewer doesn’t back up, it’ll be fine. The high desert feels good, even at 37 degrees. Housekeeping notes: (1) The blog is now on Mountain Time. (2) I can’t post pictures because we are on Verizon’s “extended network”. For some reason, the slow speed of that network doesn’t agree with our blog software and I can’t get photo files to upload. I also can’t successfully FTP them. So any photos you see in tonight’s or tomorrow’s blog entries are the result of my emailing them to one of my correspondents, who posts them for me. Hmmm… just when the weather gets nice, we have to go. We’re being pressured by our airplane tickets again. That deadline for getting to Tucson is looming over us. It would have been nice to stay in Myron’s courtesy parking spot another night, and it would be even nicer to stay through the Region 9 Vintage Rally that starts on Thursday. But we’ve lingered as long as we can. If we stayed any longer we’d have to rush through New Mexico. As it is, I am sorry to be bypassing Big Bend National Park. That’s practically a crime. We took the scenic route west from Austin, and didn’t join I-10 for about 150 miles. This was a great way to see more of the hill country, and generally get a nice feel for that chunk of Texas. Eventually we ended up on the interstate, and at that point the speed limit was a breezy 80 MPH. That’s the highest speed limit we’ve ever seen in the United States, and I am told that it will go higher still as we head further west. For the record, we don’t tow over 70 MPH, although I suppose we could. Myron and I had a talk this morning about the problems of blown tires (he’s had a few and so have many other Airstreamers) and I am not eager to experience the joy of a trailer tire blowing at highway speeds. So I watch the speed, and checked the pressures this morning and all the lug nuts too. 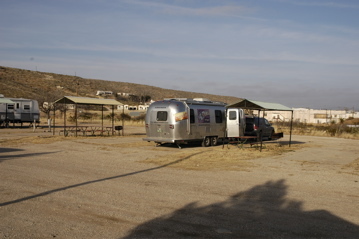 We’re parked at the Caverns of Sonora RV Park about seven miles off I-10 in Sonora, TX. John had suggested we check out the cave tour but Emma is not psyched. She says she’s seen a lot of caves and they’re all the same. Too bad … because we are headed to Carlsbad next. But since she’s unexcited, we are going to skip the tour here ($20 per adult, $16 for kids) and just take advantage of the cheap pull through sites ($15/night water & electric) for the night. 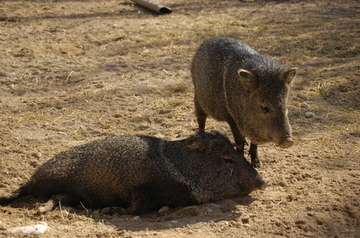 One feature Emma does like about this place is the animals. Many deer are roaming around here, and a couple of peacocks too. The deer are natives, the peacocks are imported. I’ll shoot a picture in the morning and try posting it from one of the wi-fi enabled Texas highway rest areas. Our Google Earth location. If you zoom out on Google a bit from our location, you’ll see a maze of little dirt roads and what look like house sites. Actually, I believe they are all part of the big oil field in this area. Nobody seems to live out here, but the oilfield roads go everywhere. Over the past few weeks I’ve been working with Joe via email, to figure out when and where we are going to head into Mexico. We still don’t have a firm plan but a few ideas. The latest plan is to extend a trip beyond what we had originally considered. We’re looking at a cross-Mexico trip through Sonora and Chihuahua. Soon you’ll be hearing a lot about that as we figure out the details of traveling in Mexico. One tip I got from experienced Mexico travelers we’ve met was to get Mike & Terri Church’s book, “Traveler’s Guide to Mexican Camping.” Chapters 2 and 3 of this book should be mandatory reading for anyone considering taking an RV into Mexico. I’ll explain the issues, and what we’ve decided to do, as we go. This morning I met up with Liz Lambert at Jo’s Coffee. Liz is the owner of the retro-cool Hotel San Jose on South Congress Street (just a few blocks from Pecan Grove). I hooked up with Liz because she’s interested in vintage trailers. 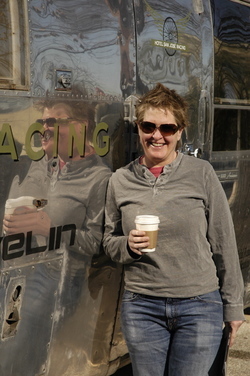 So much, in fact, that her current project is to refurbish a bunch of old Spartan, Vagabond, and other 50s and 60s trailers, put them on 15 acres of land in Marfa TX, and sell them as condo units. I interviewed her for the magazine, and we’ll drop by the project in the next few days. Liz’s hotel is also the major sponsor of a bicycle racing team. 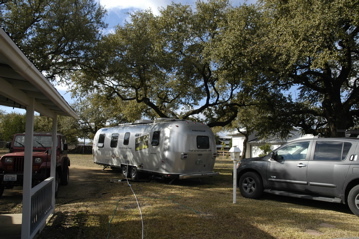 They use this Airstream to transport their bikes and equipment. We couldn’t get another night at Pecan Grove, so we hitched up and moved out to a courtesy-parking spot by Lake Travis, at the home of Myron F. A beautiful spot, but we hardly had a moment to enjoy it before it was time to head off to the Lady Bird Johnson Wildflower Center to meet John for a personal tour. John, another Airstreamer, volunteers at the center and is on the Board of Directors. The wildflowers aren’t in bloom this time of year, and many of the plants were dormant, but thanks to John’s interpretive guidance, it was still interesting. The architecture and design of the buildings and landscape are excellent. The center also boasts one of the largest rainwater collection systems in the world, which you can see a small piece of in the picture above. Giant 10,000 gallon cisterns made of native stone hold the rainwater. Since it’s off-season, entrance to the center is free this month. 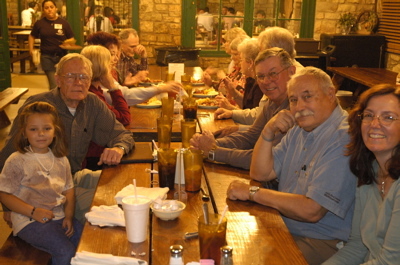 Tonight we met up with my old friend Vicki, who moved down here about fifteen years ago, and took her out for dinner at the Salt Lick in Driftwood (just outside Austin). We were here last year. 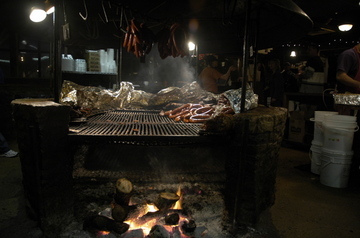 It’s a great spot for barbecue. It’s so popular on weekends that they have to enforce a 90-minute limit for diners. We used up every minute catching up with Vicki, and another hour in the parking lot outside. I was awoken this morning by an unfamiliar sight: sunshine in the bedroom window. The dismal weather has broken, at least for a day. 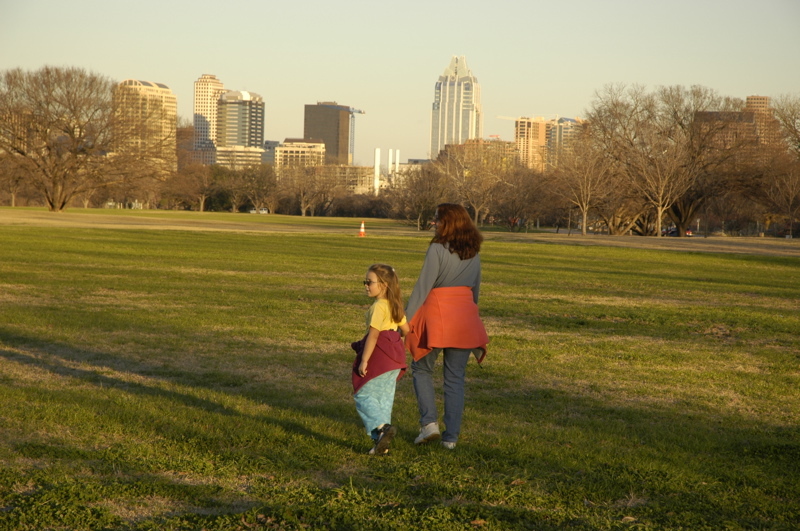 I had work to do, but at least in the late afternoon we got a chance to take a long walk along the Town Lake (that portion of Lake Austin that flows through downtown). Town Lake looks like a river. From Pecan Grove it’s a short walk down Barton Springs Road toward Zilker Park and the trails that run along the edges of the lake. Today, enjoying the respite of sunshine after weeks of rain and cold, the locals were crowding the wide dirt and gravel trails, jogging, mountain biking, and pushing baby strollers. Our loop was about four miles, but thanks to bridges and alternate routes you can program in any length you want. 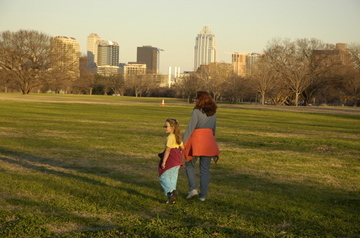 With the Town Lake trails, Zilker Park, a botanical garden, a sculpture garden, and the entire downtown, Austin has some great opportunities for pedestrians, unlike many other cities. 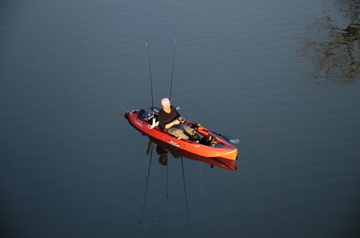 A quiet tributary to Town Lake gave these folks an opportunity for fishing and boating too. It’s nice to be able to take a picture like that in January. On the way back along Barton Springs Road we saw a little of the neon starting to light up. 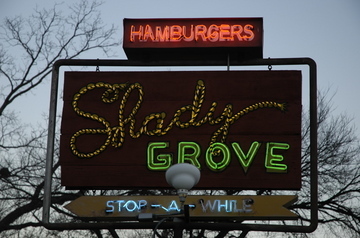 Elaborate neon signs are all over Austin, but I won’t have time to get out tonight to shoot as many of them as I’d like. I wonder why they are so commonplace? They look terrific — colorful — exciting and retro.